If you're like me, you haven't quite finished you holiday shopping and the clock is ticking louder and louder each day. I shared a gift guide last year - which could still provide some solid inspiration for your list - but thought I'd share a few of my favorite things and a couple items I wouldn't mind finding under my tree, to try and lend a helping hand. I love and highly recommend this amazing Checkmate blanket Scarf from Madewell (#1) that keeps me toasty warm in a chilly office, the Believe Training Journal (#2) which has kept me on track through the past year of running, Oiselle's Power Stretch Mittens (#3) that keep my hands warm on cold winter runs, and the beautiful and simple Cedar Street Darla wallet (#5) from Kate Spade that's been in my purse for years. 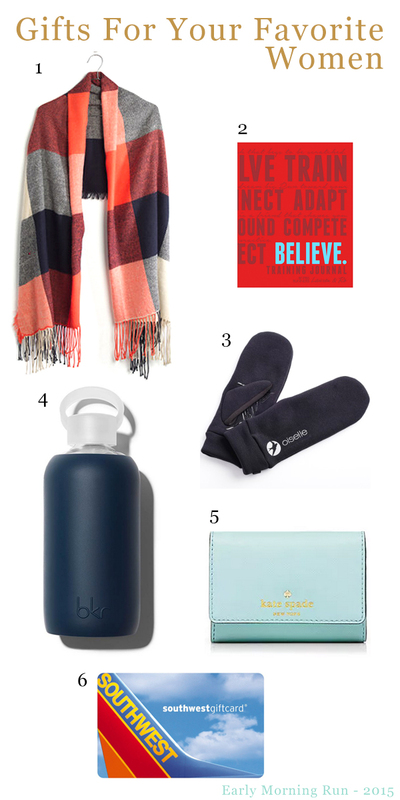 And what adventurous woman who appreciates good things wouldn't love to receive a stylish Bkr water bottle (#4) that's equally appropriate at the gym and in the conference room, or a Southwest gift card (#6) to make that runcation getaway a bit easier on the bank account? Have you finished your holiday shopping? Do you enjoy any unique gift giving traditions with your friends or family? Keep an eye out for my gift recommendations for the guys in your life...coming soon!